A $350.00 per week deposit is required to lock in your motor home rental model. This deposit is nonrefundable but can be transferred to other dates within a 12-month calendar year of the date you cancelled. Payment forms accepted at reservation include cash, bank check, MasterCard™, Visa™, Discover™, Amex™, and debit cards. If a cancellation is done within seven (7) days of pickup day, the deposit is lost and not transferable. If weather conditions do not permit the pickup of your RV rental due to unsafe conditions or insurance coverage is temporarily interrupted by our carrier due to hazards such as snow or ice storms, hurricanes, or strong winds that would cause your rental driving to be in danger, your reservation will be rescheduled when warnings and conditions improve, or if advisories exceed your schedule deposit can be transferred to other dates. A damage deposit of $3,500.00 is required to be left at the time of RV pickup. This deposit is accepted by bank check or credit card only. This deposit is released within seven (7) business days after RV inspection, and any outstanding charges will be deducted from this held deposit. Our Motorhomes are equipped with an electric canopy which is available to be used but if damaged it will be deducted from the security deposit on file. This deposit is accepted on the day of pickup and is also released seven (7) business days upon RV inspection. The security deposit must be in the contract holder's name only and, if payment by credit card, the card must be present and signed for. All drivers must be 25 years of age and have a clean driving record: No more than one minor traffic violation or at-fault accident and NO major violations (reckless driving, hit and run, driving while under the influence of drugs or alcohol), in the past three years. When you leave our dealership, you have full insurance coverage through our rental carrier; an insurance card is provided in your information binder. New York State limit law is $50,000 liability insurance. Our insurance carrier will provide you with a $1 million liability insurance umbrella for a daily charge of $14.95 as well as offer you personal property insurance for $4.95 per day. This transaction is processed on their website on the day of pickup for you. For more information, visit MBA Insurance™. No cash or checks are accepted for insurance. You can only pay with MasterCard, Visa, or Amex. No towing allowed under any circumstances. Our hitches are locked and are only unlocked for a bike rack we provide for $65.00 weekly or when you bring your own bike rack at pickup. No lock keys will be handed out. This is an insurance restriction and will not be waived in any way. No drop offs are permitted on a Sunday. Pickup and return times are 10 a.m. Any overtime is charged at $50 hourly, so please be prompt. 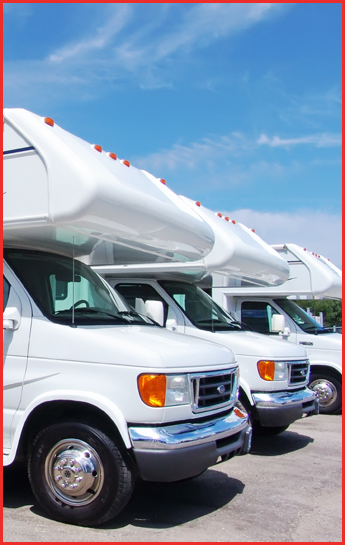 Other families are relying on your RV return to be as per your reservation. The RV you receive is released with full tank of gasoline, full propane gas, an empty toilet, and a clean interior and exterior. We require the RV to be in this duplicate condition so that there are no charges to you at return. You will receive a full description of rental policies at your pickup. A $99.00 basic cleaning fee will be charged to each rental reservation. This fee is for a general cleaning upon your return. If your RV is returned in a very dirty state, a $200.00 fee will be assessed plus any carpet and upholstery cleaning if required at an additional charge. Our coaches are private so a special approval must be obtained before a dog can travel in our RVs. This is required because some of our coaches are NOT pet approved, so please ask an agent about this. Dogs that weigh up to 40 lbs. are permitted, but we do not allow cats. A $200.00 cleaning fee will be added to your reservation for the appropriate animal sanitizing process so that all our rental guests are comfortable after you return the RV. There is a two-dog maximum. It's our goal to make sure you receive the model coach you reserved, but in the event of an accident or a safety concern on your individual coach, we may need to replace it with an RV of similar size and amenities to fulfill your reservation. Travel America RV Center reserves the right to refuse any applicant a rental.